Louth town councillors have agreed to raise its budget precept by 28.9 per cent for the year ahead - despite some concerns that it would be too great a burden on tax payers. As reported last week, the town council approved a precept request of £379,197 for the 2019/20 financial year, which equates to a 28.9% rise. This means that an average ‘Band D’ Council Tax payer will pay an annual charge of £75.95, an increase of £21.37. This equates to a charge of £6.33 per month, or £1.46 per week, for ‘Band D’ taxpayers. Councillors approved the decision by 13 votes to six, but only after a heated debate on whether or not the increase was too large - and whether Louth residents would be getting value for their money . Councillor Pauline Watson said: “I shall not be voting for it, I think it’s ridiculous. Part of the justification for the precept increase had been to ‘future proof’ Louth, as town councils are expected to be subject to a ‘cap’ on tax increases in the near future - and also face having to take on more services, such as grass cutting and weed spraying. But Coun Watson said: “You can’t just say to the person in the street ‘we put it up 28% because next year or the year after we may have these assets that we have got to look after’. Coun Ros Jackson agreed: “(The increase is) too high, we’re not going to be providing enough services with that increase immediately to offset that large change to people’s bills. Coun Eileen Ballard disagreed, saying: “I’m not saying it’s necessarily right, or that we want to put things up, but live in the real world! Coun Laura Stephenson made a heartfelt plea on behalf of those, including herself, in receipt of council tax benefits. Coun Stephenson said: “I still pay, at the moment, £48 a month for Council Tax. “And that’s with council tax benefit at the highest rate. “There is no way that this is affordable if you are on any kind of benefit at all. You just can’t afford it. 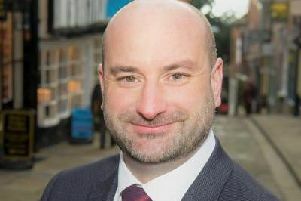 Coun Andrew Leonard suggested that those speaking out against the proposed increase - which had been agreed in principle at a governance and finance committee meeting at the end of last year - were ‘grandstanding’ ahead of the local elections in May. • What are your views on the increase - is it too high or is it justified? Email louthleader@jpimedia.co.uk.